Open Immigration: Has the Pushback Begun? According to Objectivists such as Craig Biddle and Diana Hsieh, a person should be free to emigrate from country A to country B as long as he doesn't have a criminal record, an infectious disease, and isn't a terrorist or a terrorist sympathizer. This is commonly called "open immigration." Most Objectivists associated with the Ayn Rand Institute appear to be for it. Harry Binswanger is even more radical. This is a defense of a policy of absolutely open immigration, without border patrols, border police, border checks, or passports. After a phase-in period, entry into the U.S. would be unrestricted, unregulated, and unscreened, exactly as is entry into Connecticut from New York. If 100,000 men from the Taliban region of Pakistan want to come to the United States, Binswanger thinks they should be allowed in, no questions asked. Leonard Peikoff, Ayn Rand's legal and some say "intellectual" heir, is against open immigration. Now, on the website of the eccentric Ed Cline, one Ed Mazlish has posted an outstanding rebuttal of open immigration. A free society with a government limited to protecting individual rights is a monumental achievement in the history of mankind - it is not the product of random happenstance or chance, as tens of thousands of years of tyrannies demonstrate. It is not something that occurs in nature, waiting for man to come and pick it off trees as though it were low hanging fruit. A free society has certain cultural requirements and prerequisites, without which it could never be created and without which it cannot be maintained. Proper immigration policy must reflect these facts and must serve to preserve the cultural factors on which a free society is based. The true justification for immigration restrictions is the need to protect those who respect individual freedom from those who are cultural collectivists - not the need to protect the welfare state from overload or even the need to protect innocent Americans from jihad. Even if the welfare state were repealed today and all jihadists were terminated tomorrow, the ideological requirement to protect a free, democratic, and rights respecting society from masses of incompatible cultural collectivists would still remain. Hopefully, writers such as Biddle and Binswanger will respond to Mazlish's critique. I'm not holding my breath. 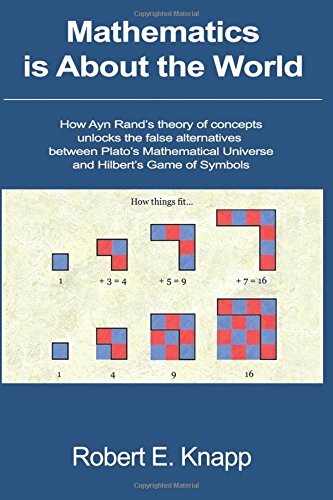 Robert Knapp: Mathematics is About the World: How Ayn Rand's Theory of Concepts . . . .
Robert Knapp (ex brother-in law of Shoshana Milgram, future Rand biographer) has a book out about mathematics. He is associated with the Ayn Rand Institute. Well, the books just keep on coming, don't they? I don't see how you can get 532 pages on mathematical theory from Ayn Rand's theory of concepts, but what do I know. Certainly things have changed for the better in terms of books by Objectivist writers. There was next to nothing not too long ago. Robert "Rewrite" Mayhew will soon be coming out with The Unconquered, with Another Earlier Adaption of We the Living. The first substantial fiction of Rand to appear in over twenty years, this important volume contains two never-before published versions of the play - the first and last versions (the latter entitled The Unconquered). With a preface that places the work in its historical and political context, an essay on the history of the theatrical adaptation by Jeff Britting, the curator of the Ayn Rand Archives, and two alternative endings, this book is a must-have for anyone interested in Rand's philosophy. Well, let's just say that anything Prof. Mayhew edits should be used with extreme caution. That being said, I enjoyed his collections of essays on Rand's fiction. The first publication to offer a serious academic study of Rand’s often marginalized corpus, this comprehensive companion provides critical analysis of her prolific and iconoclastic writings, including her novels, her political commentary, and the essays in which she laid out her philosophy of Objectivism. The editors and the comments about "original research . . . from the Rand archives" makes me think that all the contributors will be associated with the Ayn Rand Institute. While ARI writers have produced much good material, it tends not to be very critical. Of course, this book will not be "[t]he first publication to offer a serious academic study of Rand's often marginalized corpus . . . ." In the early 80's Den Uyl and Rasmussen edited The Philosophic Thought of Ayn Rand. The book was something of a mixed bag, but certain essays were quite good. Leonard Peikoff published many years ago The Ominous Parallels: The End of Freedom in America. Peikoff argued that America was on the same path as Germany during the Weimar years. There were chapters on Germany and chapters on the U.S. In November The Cause of Hitler's Germany will be published. The cover says "previously published in The Ominous Parallels," so I'm wondering if its just the chapters on Germany. In any event, the book had its share of problems. One of Peikoff's sources was Rauschning's The Voice of Destruction (aka Hitlers Speaks), which is now known to be bogus. 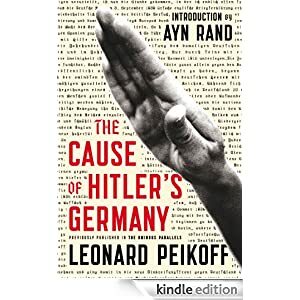 Some of the alleged Hitler quotes that Peikoff uses from this book sound too good to be true, such as "We are now at the end of the Age of Reason"
David Gordon discusses Murray Rotherbard's life. Brief mention of Rand and Objectivism early on.